Tour includes our exclusive buffet of grilled meat, fresh seafood, variety of fruit and vegetables. Swim through a small window-sized cave and hold your breath for what waits for you at the Secret Lagoon--a pool of clear water surrounded by beautiful limestone formations. It is reminiscent of a James Bond movie, with its cool water and sleek floors walled in by sharp cliffs jutting out to the blue sky, and light coming in through a small opening. Be mindful and try not to visit when it's crowded or it won't be so "secret" anymore. Small Lagoon is located at the cove of Miniloc Island. Enclosed by sheer rock cliffs that cut upwards from the water, there is nothing small about this lagoon, and a kayak is highly recommended to explore it. The boat docks about 50 yards from its entrance, which is the size of a garage. From there, it's another 15-minute swim end to end. There are two minor caves by the lagoon entrance that are just small enough to stick your head in. These are located to the left and right as you enter the Small Lagoon. Deeper inside the lagoon you will find a small cave with a pool you can swim in. A patch of light from above makes the swim to this cave majestic. There's a resting rock about two-thirds of the way to the cave but you still have to endure a return swim back to the boat. A kayak can make this stop much more enjoyable. There's a cove right before the cave where you'll find a smaller lagoon. Kayak or swim as close as you can get to the far wall rock formation then look up. WOW. Big Lagoon by far is my favorite lagoon. What makes this special are the two cliffs guarding the entrance--a favorite spot for selfies! There are more than a handful of ways to enjoy this lagoon. 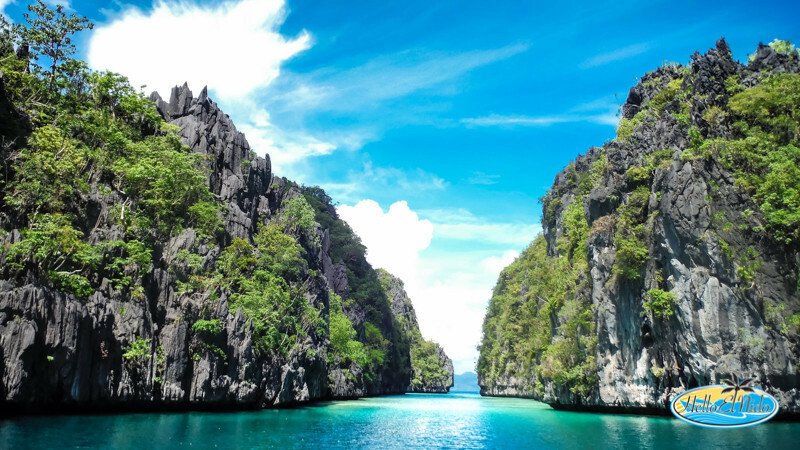 For some they make this just another scenic tour, but with HELLO EL NIDO it becomes so much more. Upon entering, we will make a rendezvous around where you'll see the majestic limestone rock formation that surrounds the Big Lagoon. Depending on the season, low tide can prohibit the boat from sailing into the Big Lagoon. If you've rented a kayak then it's no problem. Here's a secret tip: right before the exit, there's a cave unbeknownst to some that you can kayak through and through. It's about 25 meters long and 4 meters wide. There are two awesome spots for snorkeling close to this cave and right as you enter the Big Lagoon and 80 meters before the cave. Be careful though as there are urchins on the sea floor. When there's a chance, I dock my boat in the middle of the Big Lagoon and serve lunch. It is an experience one could only dream about. Shimizu Island's crystal waters and coral reefs make it a great site for snorkeling. Kayak or swim to the other side of Shimizu where you can see a view of the open sea. 7 Commandos Island boasts of white sand and crystal waters. The names of seven long-ago inhabitants can still be found written on rocks. This is a party beach where you'll find a couple of bars and enjoy coconut, beer, cocktails, shakes and snacks. You can also enjoy volleyball, snorkeling and visit the private Vellago resort.